Here is one more proof of Bennie's ability to get his hands on the very finest large stones of natural, untreated Royston turquoise. This large free-form stone exhibits a rich blue coloration with an undulating surface and fine-grained splendor that is polished to perfection. Stones of this size are an absolute rarity and because such large stones are so rare, they command a premium on the market. 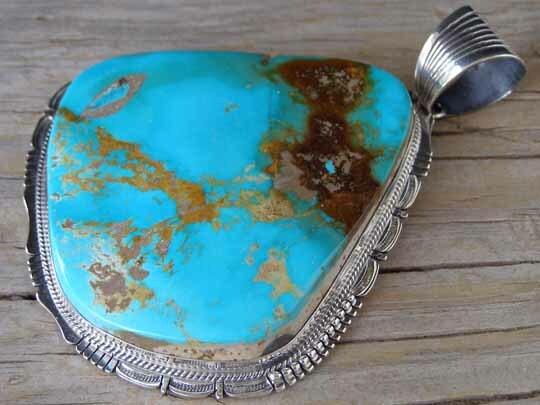 This very thick, large stone of natural, untreated Royston turquoise is set in a smooth bezel wrapped with twist wire. Bennie decorated the pendant's border with his renowned saw and file work and rows of raindrops. Stone: 2 3/4" x 2 5/8"
Dimensions of pendant (excluding jump ring & bale): 3 1/8" x 3"
Total hang (icluding bale): 3 7/8"